Look at the shirt Stuart Murdoch is wearing. Doesn't it warm the cockles of your heart (located just behind the right ventricle, if I remember my anatomy) to see a musician you adore paying homage to another band? I wonder whose t-shirt Morrissey is wearing these days? Oh right, he's now dressing like a mafia boss. Oh snap! Stuart has the most softest eyes, ahh, how dreamy. I'm overdue for some good Belle and Sebastian listening. As always you serve as an excellent reminder. You're like my post-it for music listening. I like how you use these thoroughly English sayings Barbara. As you probably know, we say the most oddball eccentric things and we've a tendency to make a statement or ask a question using 10 times the amount of words necessary. I'd like to see Mozzer in a Fergie T shirt. I'd laugh for about 3 years. I love the Smiths too, Michelle. All the hip kids are being total 80s nerdazoids these days, don't you know? Ahh, perhaps I got the cockles of my heart mixed up with the bottom of my heart, but presumably that would be beneath the ventricles. hmmm. Stuart is pretty beautiful, isn't he? Even if his mom does cut his hair. You should use that phrase, Allison, it's very satisfying. And you know I am seriously tempted to yell booooo when displeased these days! I'm a post-it note, hahahaha! I am so putting that on my resume. hahaha the Mozfather in a Fergie t-shirt! The NME would have a field day with that one, Ben! We do tend to use a lot of British phrasings in Canada - it must stem from our Dominion days. Sometimes only a good wordy phrase will do. I am absolutely using "you are about to incur my displeasure" in my next OD letter, as my homage to you. Might as well have fun with it, right? Aren't they wonderful, Mel? Sometimes only B&S will do. Hehehehe "Mozzer in a Fergie T shirt" reckon I'd laugh for about 3 years too. Brilliant. I think the whole world would laugh for three years on that one, Kees. Those not in on the joke would be wondering, why are those people giggling, shaking their heads and wiping their eyes, and proclaiming "oh Moz!"? I think so too, Deb. 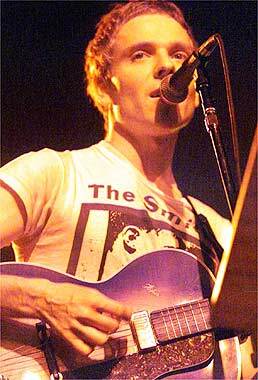 Stuart Murdoch has such a beautiful voice. So who do you love (more)? Moz and co. or Murdoch and friends? I guess it's hard to love too many bands more than the Smiths. Paying homage to one of my favorite cities (Amsterdam) with the shirt I am wearing now. I like shirts that pay homage, Will, whether to a band or a city or a bag of potato chips. There is no denying how important and how wonderful the Smiths were, but for pure unadulterated love, I would have to take Belle and Sebastian over them. I haven't had a band shirt for some time now, but I like paying homage to my favorite things - Chuck Norris, Che, Amsterdam, college radio ... Hillary has a really awesome Neko Case shirt. Sounds liek between the two of you, you and Hillary have a pretty cool t-shirt collection. I don't have that many band shirts myself, and the ones I do have Eva keeps stealing. I have the "Hatful of Hollow" shirt. It's black and blue though. Looks better on Stuart Murdoch than on me. I don't know Hilary; while I admit that Stuart looks very fine with his Smiths' shirt, I'm sure you look equally fetching. I'd love to see a pic of the two of you together wearing your hatful shirts.